Rodríguez home, "la azotea," 2013. K Dykstra. Catch and Release – an English phrase – is the title of a poetry collection composed in Spanish by Reina María Rodríguez. Throughout this book Rodríguez makes repeated reference to objects and occurrences that fall short of desires. Her pattern of representing shortfall became a conscious element as she completed the composition of the book. The different people who wander, briefly sketched, through the poems are less aware of what is happening to them. Some of these poems are spoken by a lyric "I," but linking this person to the stable and anchored self informing a tradition of conversationalist poetry is an inadequate starting point, even though Rodríguez has drawn from that influential strand of late-twentieth century literature in Cuba. If at first it seems natural to assume that "I" is Rodríguez herself, she gradually, inexorably, pushes the self into antonomasia. With this rhetorical effect, a writer becomes less and less an individual person: the "I" reverses, moving away from uniqueness and toward an abstracted, generalized image imbricated in the experience of loss. "I" becomes a writer, an artist in general. Each self folds into the book's larger parade of figures all struggling to create things in the image of their desires. They encounter limitations, over and over. As Rodríguez told me during the translation process, these collisions with limitation and a subsequent incapability of the artist-figures to realize their creations to their fullest signal the dominance of economic and social limitation over everyday life. Enter simulation: a strategy for creative response to limitation. The opening text of Catch and Release is a short prose block which refers to a tabletop made of plastic rather than glass. As I peppered her with questions about this text, Rodríguez told me that the tabletop – like other details planted in the same scene – calls up a world cobbled together out of its own unrealities. This, for her, is kitsch. So I would go into a forest too – one simulated by the bougainvillea planted many years ago inside a metal flowerbed. Beyond it the white table, which lent a curve to my determination to spot the glints given off by one more morning. Colorwashed houses, twisted railings from childhood, vulgar sounds of need that merged nearby (in my vision) into the landscape of real devastation then constituting my life. The same skinny birds and a cat aging on a threadbare cushion, all patterns traced by the light passing through paper simulating a stained glass window; the cat wearing an eyepatch would follow a red dove, never daring to eat it, and a “maybe it’s all the same . . .” from its flight sustained as mirror, as choreography. Down this road toward the dawning forest – toward my old age – toward the cutout doll of a writer, a character (not bony or sentimental or radical or committed) always waiting for fate – like a nonconformist love from the past – to arrive and surprise her with a curfew just around the other side of the door – the same sound made by the table constructed with plastic instead of glass: the woman who dreamt every day about catching fish in her torn imaginary and then releasing them. Fate would bring her (and leave me) the perpetually lost “thing” that summer denied. Así que yo también entraba a un bosque –simulado por la buganvillia sembrada muchos años atrás en un cantero de metal. Más allá, la mesa blanca redondeaba mi ambición de ver aún los destellos de una mañana más. Las casas pintarrajeadas, los hierros retorcidos de la infancia, los sonidos vulgares de la necesidad que se fundían cercanos (en mi visión) al paisaje de la desolación real que era, por aquellos tiempos, mi vida. Los mismos flacos pájaros, el gato envejecido sobre un raído cojín, con sus líneas pintadas por la luz en la calcomanía, perseguía con los ojos vendados una paloma roja que nunca se atrevió a comer, y un “lo mismo tal vez . . .” de aquel vuelo mantenido como espejo, como coreografía. Por este camino hacia el bosque mañanero –hacia mi vejez—, hacia el personaje recortado de una escritora (ni huesuda ni sentimental ni radical ni comprometida) siempre esperando que la suerte –como un viejo amor inconforme—llegara a sorprenderla con un toque de queda en redondo a la puerta –igual al sonido de aquella mesa plástica por cristal –, cuyos peces soñaba que cogía y soltaba por el imaginario roto cada día, y le trajera (y me dejara), “aquello” perdido para siempre que el verano le negó. Everything “here,” like the cheap plastic table, acts as a substitute for something else. In a world defined through kitsch, objects located elsewhere are the perpetually lost subject of desire. Perhaps those putatively real objects don’t even exist. Nonetheless, things “there” are constantly imagined as being more substantial, more real, than the kitsch at hand. The writer too is imagined as kitsch; and the writing: kitsch. Whereas artistry of all kinds fails throughout Catch and Release, its nebulously real counterpart -- the art that succeeds -- remains, by definition, out of reach beyond distant horizons. I include my photo of Rodríguez's home, above, in a double move. Arguably this literal home remains a key symbol of her career. 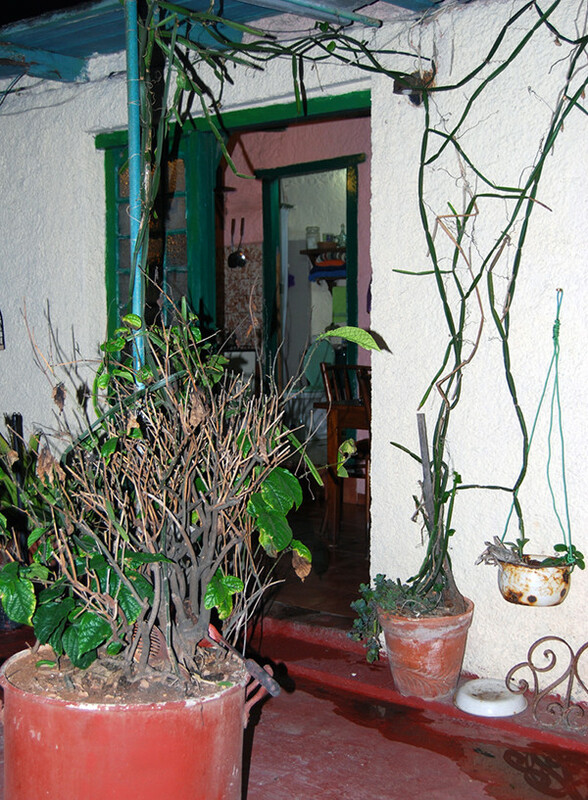 Rodríguez used her home, especially in the 1990s, to host alternative cultural events that made it famous as La Azotea (the rooftop). She still hosts occasional events there, and in terms of material for composition, she has used her home as a touchstone in many works from the 20th and 21st centuries. As I write this entry in 2015, her locations have become more complex, so contrasts between "here" and "there" may shift. The contexts for describing her own location are already morphing. Rodríguez has received more, and more sustained, invitations to travel with her rising international prominence. Very recently she has also spent more time out of the country due to her family's ongoing division via migration to various countries, including Spain and now the United States. At the same time her stays outside are temporary, so to dismiss her Havana residence and say she has simply transitioned into outsiderdom would be premature (rapid assessments of who is "inside" and who is "outside" being common in Caribbean cultural conversations). Rodríguez returns to Havana to live and organize projects there, to agonize about damage to her rooftop home, to go about rebuilding the house as best she can. She still has important family bonds there, centered around the azotea. Physical components of the azotea, such as the roof, play into her newest writings. Above and beyond those questions of place which are now figuring in discussions of her work at conferences and other events, I return to the notion of place specific to my discussion here of kitsch and of Catch and Release. Place, like personhood, becomes ever more abstracted in Catch and Release. Rodríguez draws on the material aspects of everyday life but also pressures them, transforms them -- she pushes at places in search of the very confines that define them. I offer and also disavow the azotea photo. It offers one point of entry into Catch and Release, and this is good, for the literary translator's activity involves laying out entry points for readers. But to follow out the logic of the poetry, and translation itself, the photograph's illusion -- its lines of limitation -- these kitschy gestures deployed by translators -- must equally be remarked. Catch and Release was first published in Havana by Letras Cubanas in 2006. It received a Critics’ Prize from the Cuban Book Institute and was reprinted in 2007. Seven poems from this collection, paired with English translations and engravings by a Havana artist, center a fine art edition released by Parallel Editions. This too is called Catch and Release but should not be confused with the entire book of the same name. This series tracks recognitions and convergences that give rise to bodies of work in translation. Emerging out of my time spent with Cuban poetry, as well as other writings from this hemisphere, most entries address some intersection between Latin America and the United States, and/or Spanish and English within the US. Some entries center on writers and works that motivate me to continue translating. Others loop outwards to envisage other translators & their translations, and test the frames mounted around translation. Kristin Dykstra’s translations of poetry collections by Reina María Rodríguez, Juan Carlos Flores, Angel Escobar, and Marcelo Morales are published and forthcoming from the University of Alabama Press. She previously translated other books from Cuba, including works by Rodríguez and Omar Pérez, available in bilingual editions from Factory School, Green Integer and Shearsman Books. Dykstra is completing additional books by Pérez, Morales, and the Uruguayan writer Amanda Berenguer, among others. Parallel Editions and Red Hydra Press have published and forthcoming bilingual fine arts editions with her translations of poetry by Rodríguez and Rito Ramón Aroche. With Kent Johnson, Dykstra is co-editor of Materia Prima, an anthology dedicated to Berenguer forthcoming from Ugly Duckling Presse. She co-edited Mandorla: New Writing from the Americas / Nueva escritura de las Américas from 2004-2014 with Gabriel Bernal Granados and Roberto Tejada. Dykstra lives in Hinesburg, Vermont.